I just remembered that we have this contraption hiding in our cupboard which I imagined we can use for poaching eggs, and even for cooking rice cakes. I did not really know what this is called, so I Googled photos for "egg poachers". Well, what do you know, I was right! The egg poacher makes poaching a bit easier because you do not have to mind the water; you can just have it boil merrily along. And then there's the bit where the eggs are in their own containers, so you do not have to worry about the egg whites scattering about the water and not getting all of it. I was too lazy to know the exact way to cook the eggs using this device, though, but I think it's quite foolproof enough. My experiment turned out fine so I'm sharing this with you. Place enough water in the frying pan to start it boiling. You do not need as much as when poaching the conventional way; the heat and steam will be the ones that will cook the egg in this case. 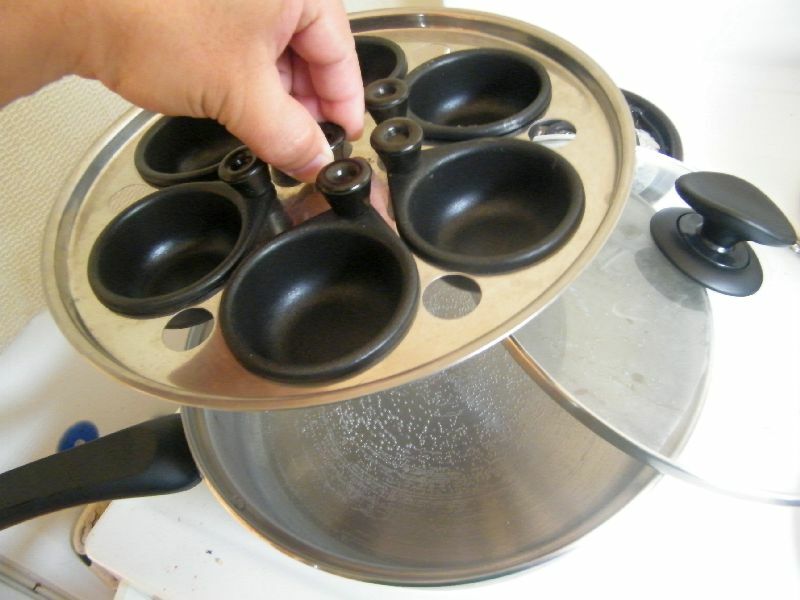 Just place the non-stick egg poachers and tray on the pan while waiting for the water the boil. This will sufficiently heat up the cups. 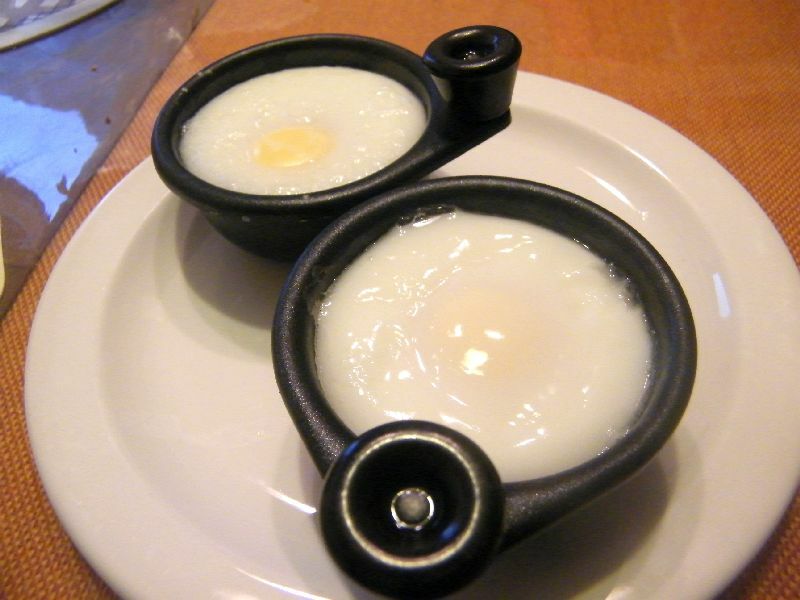 When the water is boiling, carefully break the eggs and place these onto the cups. You might want to wear mittens, remove the cups, then place the eggs because the steam rushing off the holes can give you a nasty burn. Place the cups back onto the tray and cover. Covering will ensure that the top also gets cooked, not just the sides and bottom that are in contact with the cups. 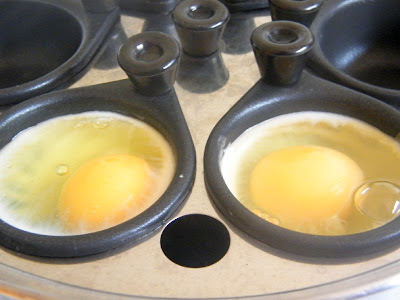 4 minutes will give you nice, firm whites and egg yolks that have partially solidified, with a substantial amount that can still ooze off, like the above photo. 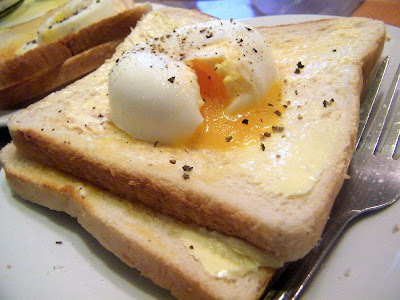 I like my poached eggs this way. I know the cups are non-stick, but I decided to help the eggs off by sliding a pointed knife along the edge. Sprinkle some salt and ground pepper and serve with toast or rice. so this is how you poached eggs and what a poached egg looks like..:D perfect! must try this hihihi.